Cognitive Analytic Therapy and the Politics of Mental Health providesan overview of the development of cognitive analytic therapy (CAT), and illuminates how the political context affects the way in which therapists consider their work and facilitates their practice. This book examines how CAT contributes to wider debates over ‘the politics of mental health’. With contributions from those working in services – including adult mental health, learning disabilities and child and adolescent therapists – the writers consider how contemporary politics devolves responsibility for mental illness onto those suffering distress. The evolving political and social attitudes clients bring to therapy are also addressed in several chapters, and there is a focus on groups in society who have been marginalized and neglected in mental and physical health services. 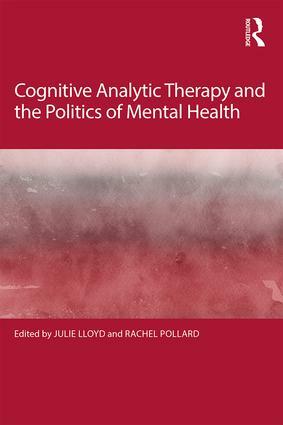 Cognitive Analytic Therapy and the Politics of Mental Health offers a fresh understanding of the contemporary politics of mental health that will be of interest to all therapists and mental health professionals. A regressive interaction of economics, theory and practice? The Italian dilemma – trust and cooperation make the world go around, but do we trust and can we cooperate?